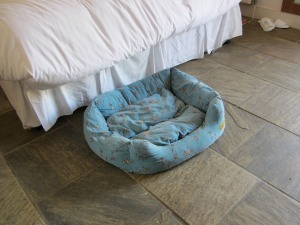 You'll be delighted to know that this is dog friendly Norfolk!! Norfolk is without doubt one of the most dog friendly places to visit in the UK. No more waving goodbye to those sad looking eyes when you set off for your holidays. With amazing dog friendly Norfolk beaches, (miles of vast expanse of sand to run wild on), incredible heathlands with views towards to the sea, and dense woodland with incredible smells, don’t even think about leaving your dog behind! And if you’re worried about finding dog friendly accommodation or places to eat with your pet, then rest assured there are plenty to discover. Norfolk welcomes you and your pet with open arms! There’s a huge range of dog friendly accommodation in Norfolk, from luxury hotels to pubs, cottages, bed and breakfasts and campsites. The only hard work you need to do is to consider the type of accommodation you want to stay in for you and your pet. 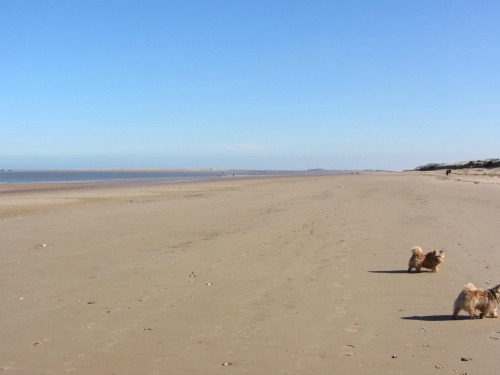 Wow – with approximately 52 beaches right around the Norfolk coast, you certainly won’t be stuck for ideas of where to take your dog for walks. What fun they can have running wild on the huge expanses of open sand, rushing into the sea and thoroughly enjoying themselves. And the best thing about letting them loose on the beach is that you can bring them back to your accommodation and they should sleep soundly all night, leaving you to have a wonderfully relaxed evening! 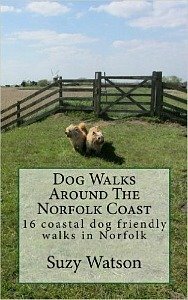 Explore Norfolk UK is delighted to announce the new publication of "Dog Walks Around the Norfolk Coast". You can read more about the book here. Norfolk is also very lucky to have lots of trails to follow and Country Parks to walk in. The Peddars Way, The Norfolk Coast Path, The Nar Valley, Boudica Way are just a few of the Norfolk trails that you can follow, to name just a few. 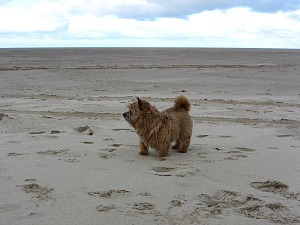 Any there are many coastal and inland walks that are good for dogs too. 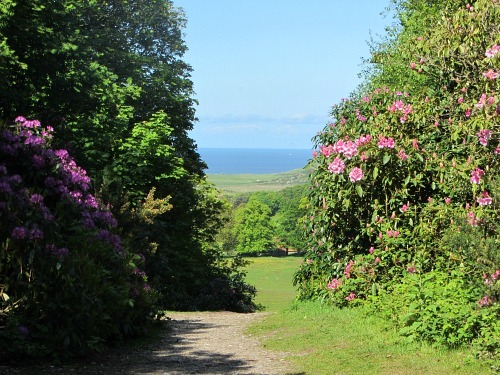 Sheringham Park and Holt Country Park are beautiful Parklands to walk around in North Norfolk with your well behaved dog. As you may know, Norfolk has some amazing stately homes. All of these have wonderful parkland where you can walk your dog (restrictions need to be adhered to due to cattle or deer in some of these parks). 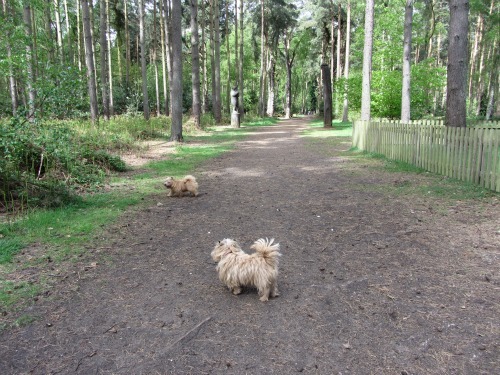 Why not take a beautiful walk around the parkland of Blickling Hall, or Felbrigg Hall, it’s different for the dogs and different for you too. You also get to see some amazing houses at the same time. Sandringham House has gorgeous woodland you can walk in, and Houghton Hall and Holkham Hall have the deer parks. Some of the Norfolk villages put on dog shows during the summer months which always provide great family entertainment. Crufts they may not be, but still fun! Hunstanton is a good example of this – The Hunstanton Fun Dog Show, usually in May of each year. The Norfolk Showground also hold an event, usually over the August bank holiday, titled “All About Dogs, Norfolk”. For fun family entertainment, why not keep an eye open for dog shows happening right here in Norfolk. So, you’ve got no need to worry about bringing your dog to Norfolk, we welcome them. In fact we love them, especially on the beaches! Your one worry, I know, is probably the accommodation, so I have highlighted a few suggestions for your ease.